You will need it to take in the beauty of this collection. 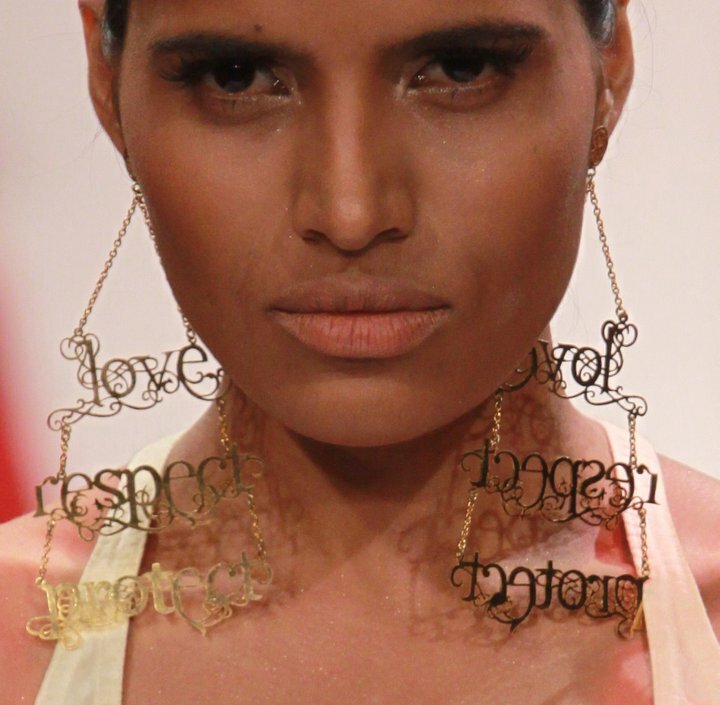 I gasped out loud at Eina Ahluwalia’s emotionally charged jewellery collection, shown in Mumbai at Lakme Fashion Week in March. 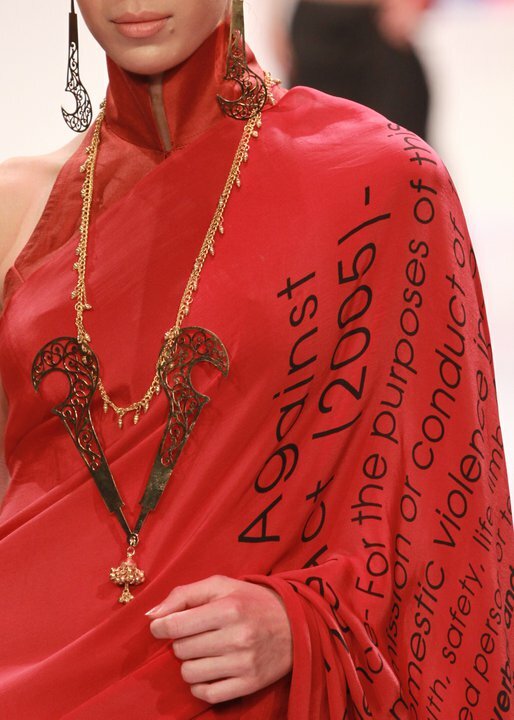 Love, respect, protect: the holy trinity (trishul) of marriage as interpreted by Eina Ahluwalia in her SS11 collection. 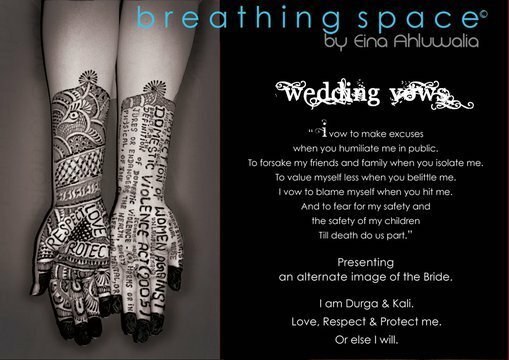 The collection, entitled Breathing Space, presented an alternate image of the Indian bride. The concept put forth by the designer. Somewhere out there, Wonder Woman is tres jealouse! 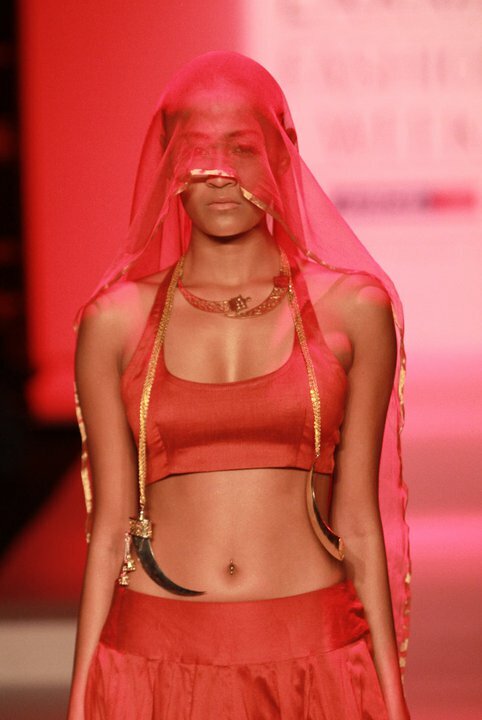 Ahluwalia's contemporary bride. That necklace fits together to form a lovely circle, but should you need it, the sword is at hand. A sun is so appropriate for the tikka, which covers the 'third eye'. 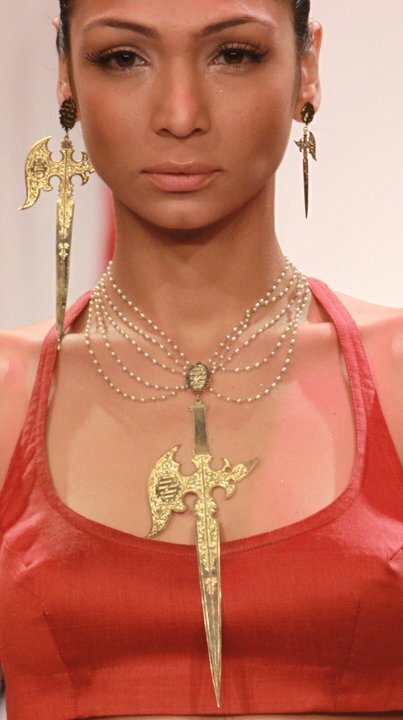 Daggers, swords and trishuls - all symbols of the power of goddesses - were prominent throughout. And then there was the power of prose, worn well. I have always loved un-fussed elegance. 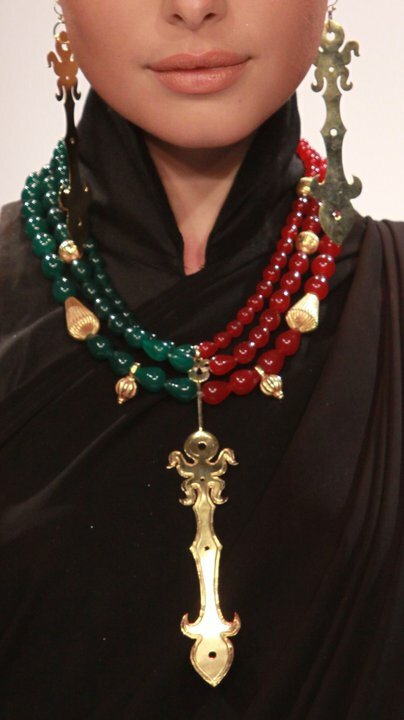 Ahluwalia's modern mangalsutra - a very traditional necklace worn by married women. Mother-in-laws in the Motherland all just collectively fainted. The tradition of red and green beads, twisted. I may not be able to live without this one. Green with envy. Carrie Bradshaw, eat your heart out. 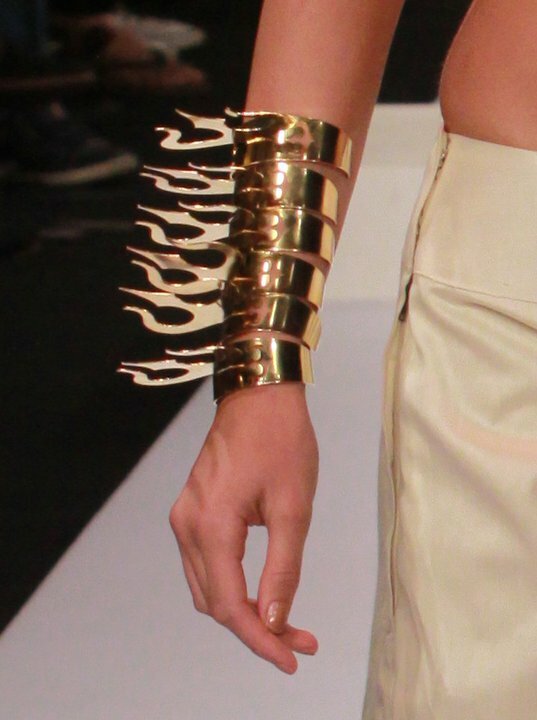 This is my favourite from the collection - delicate yet Don't Mess - all at once. 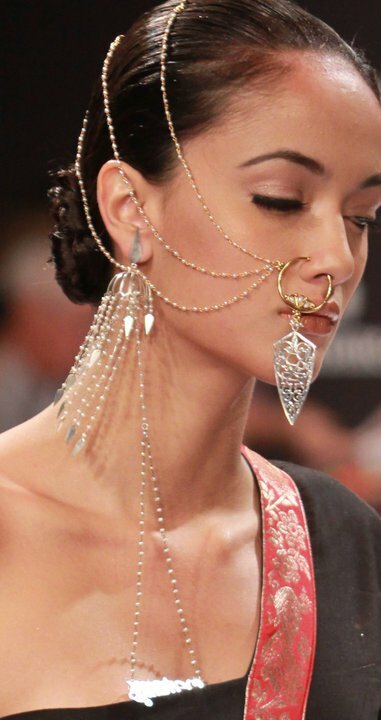 The above looks like something out of a Raja Ravi Varma painting – it also reminds me of Anamika Khanna. 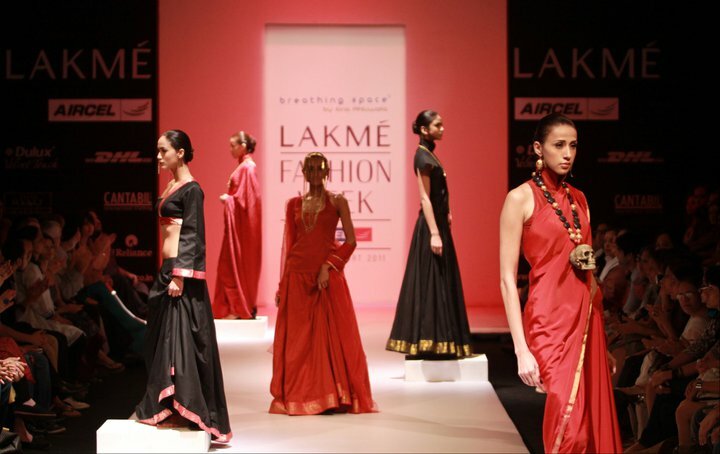 A beautiful canvas of red, black and white clothing perfectly presented the golden jewellery pieces. Nothing wrong with marriage, my dears. Just hold on to yourselves, as well. 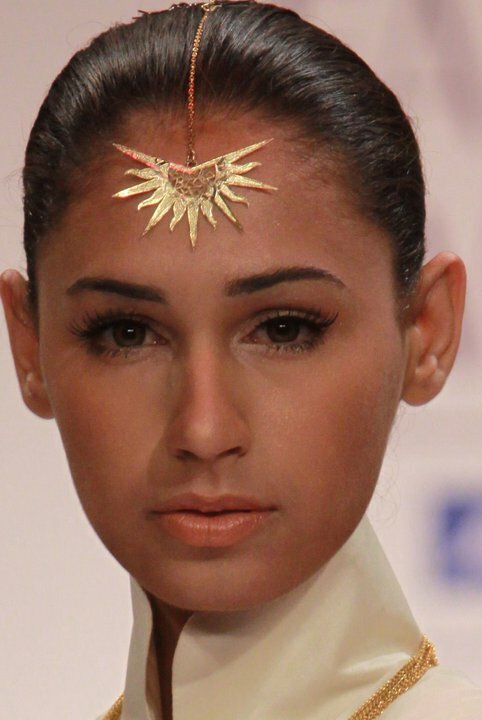 Images courtesy of Eina Ahluwalia and Lakme Fashion Week.